September 16 Fair at SPS to Feature 30+ HBCUs. 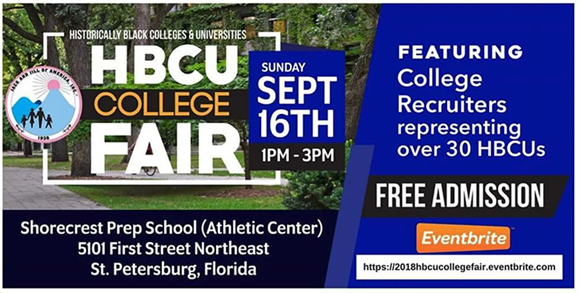 The Suncoast Chapter Teens of Jack and Jill of America, Inc. will host its second annual Historically Black Colleges and Universities (HBCU) College Fair from 1-3pm on Sunday, September 16 at Shorecrest Preparatory School in St. Petersburg. The inaugural event featured college recruiters and alumni representing over 30 HBCUs including Howard University, Clark Atlanta University, Morehouse College, Fisk University, Tennessee State, Edward Waters College, Florida Memorial and Florida A&M University. More than 300 guests attended to meet with the schools. Now in their second year, the event leaders expect an even bigger turnout of both colleges and families. "Our pilot HBCU College Fair was a great success,"says Jack and Jill of America Teen Sponsor, Dr. Nathalia Jeffrey-Fort. "Supporting and promoting HBCUs are critical components to Jack and Jill's mission of education and leadership. We're pleased to partner with Shorecrest once again for this event." Attendees will have the opportunity to speak to alumni and admissions reps from college and universities, as well as to talk with dedicated experts about general college-related topics including the college admissions process, financial aid, scholarships, Greek life, and more. "As an HBCU alumnus, I know that unique college experience strongly influenced my career choice and passion for education," says Roderick Fludd, Shorecrest Director of Diversity and Inclusion. "We at Shorecrest are proud to offer this event, not just to African American families, but to all families in our community who are exploring their options for higher education." Also featuring informational booths from experts on: College Admissions Process, Scholarships & Financial Aid, Greek Life, and more. Admission to the HBCU College Fair is free and open to the public. Registration is available online at https://2018HBCUcollegefair.eventbrite.com.